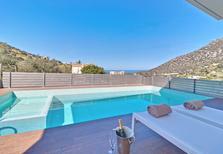 Pool villa for 8 people along the northern coast of Crete. 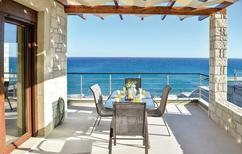 Crete | These holiday apartments and houses offer with direct sea view ideal conditions for your next Greece vacation. 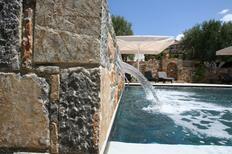 Pool villa for up to 12 people on the north coast of Crete. ​Crete | The beach is too full or too far away? These holiday houses all have an own pool and guarantee you an abundance of bathing fun. ​Cyprus | Holiday homes of natural stone not only lend your holiday accommodation a certain charm, but are also the ideal place to retreat if the summer heat gets too much. 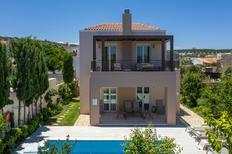 This holiday home on Sithonia lies directly by the sea and was awarded an average of 4.8 out of 5 possible points. We hereby present you with the best-rated holiday homes in Greece: On Crete, in Chalkidiki, on the Peloponnes or the islands in the Ionian Sea. You’ll find a beautiful holiday apartment above this little beach in Kiveri on the Peloponnese. An atraveo customer wrote "This holiday home is beautiful." 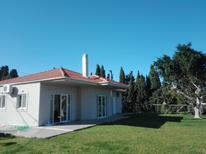 about this house for 5 people on Corfu. Greek | Great holiday for not much money? No problem. Here we offer you a selection of holiday apartments and houses that are not expensive and at the same time have been rated very good by other travellers. An infinity pool with a sea view awaits you at this villa for up to 8 people on Corfu. Greece | The low edge of the infinity pool makes it seem as though you can swim directly into the landscape. A holiday house on Crete costs on average USD 1,199 in the cheap travel period and USD 2,224 in the peak season per week. These details are of course in relation to the house and not per person as well as includes the obligatory additional charges. Baedeker recommends atraveo: Crete 2013, page 119. Dumont recommends atraveo: Crete 2014, page 15. Crete is the most popular holiday destination for those people who want to spend their holiday in Greece. Due to the diverse countryside the biggest island in the eastern part of the Mediterranean Sea provides the holiday maker with many alternatives and options. Crete, the largest Greek island is valued both for its natural beauty and remarkable history. From Minoan palaces to Byzantine monasteries and from the isolated caves to the palm fringed beaches, Crete has every ingredient to fascinate a discerning traveller. Choose from the holiday homes on Crete offering spectacular views of the mountain ranges and dramatic gorges or book one of the pretty holiday rentals on the beachfront. 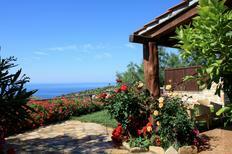 The best time to take a vacation in a holiday home in Crete is during May. It’s the ideal month for swimming and the mountains come alive with vibrant wildflowers. Rent holiday apartments way in advance if you plan a July or August visit. The best holiday homes are quickly booked up during these months making holiday houses hard to come by. Walking tours of Crete are highly recommended and kayaking is an interesting way of getting around the island. Scuba diving and snorkelling can be enjoyed at the nearby island of Karavos, ideally during Spring and Autumn. The ancient palaces of Knossos and Mallia are a must visit for history lovers. So is the port of Hania in West Crete, which is reminiscent of its beautiful Venetian heritage. Hiking and trekking along the mountains and gorges are very popular here to destinations such as Lefka Ori, Dikti Mountain and Samaria Gorge. 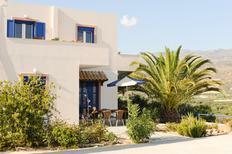 Good value holiday apartments are mostly located in the inland villages and along the southern shoreline. For sun and sand, retreating to the holiday houses on the north coast is ideal. 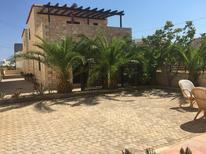 Crete’s capital city, Iraklio, with its round the clock party culture is also a great place to find holiday rentals. Kalamaki is also a popular destination.